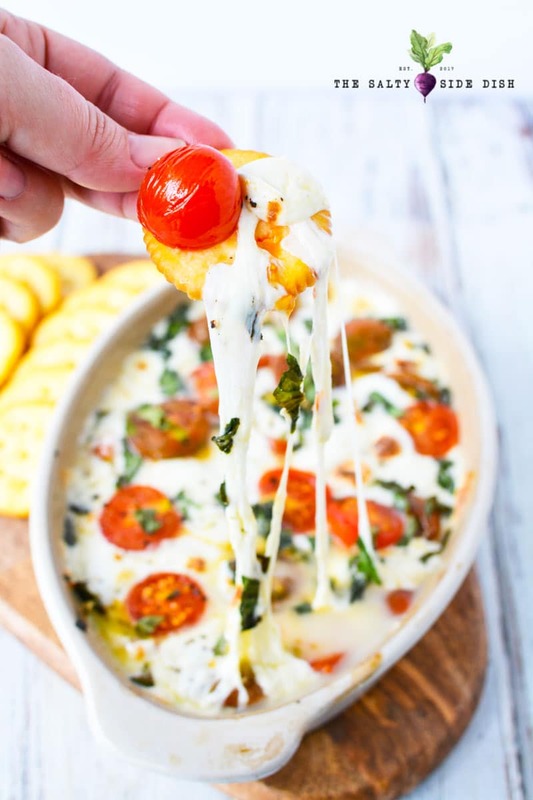 Hot Caprese Dip is an amazingly cheesy appetizer that folds your favorite flavors of caprese salad into a melty dippable recipe perfect to serve pipping hot to excited friends and family. The holidays are just around the corner and that means that you will be serving (and be served) tons of amazing food. From carb loaded potato salad to totally healthy side options like keto friendly cauliflower casserole, the possibilities are endless. But before the food comes the food! This hot dip recipe is a great appetizer that you can heat up and in 20 minutes or less, have a perfect way to dip and enjoy. 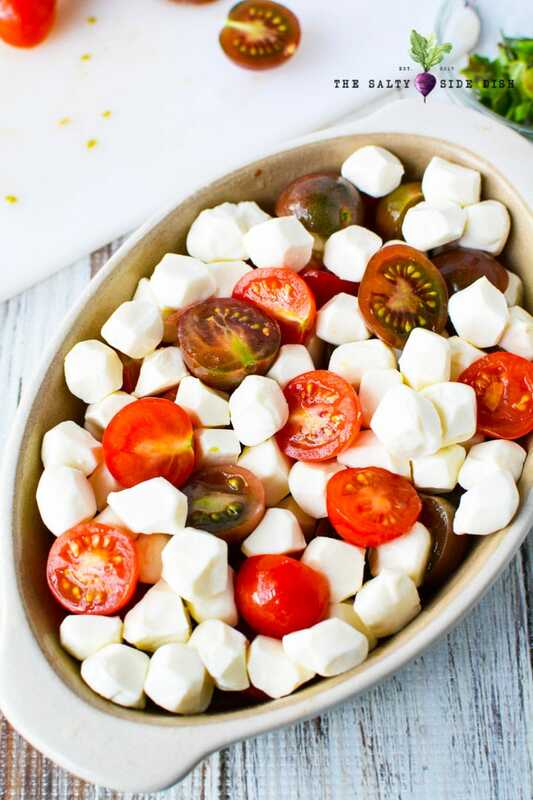 Now there are plenty of dips out there that you can serve cold, like 7 layer taco dip and deviled eggs dip, but because this one includes fresh mozzarella balls, its a make and serve immediately hot dish. 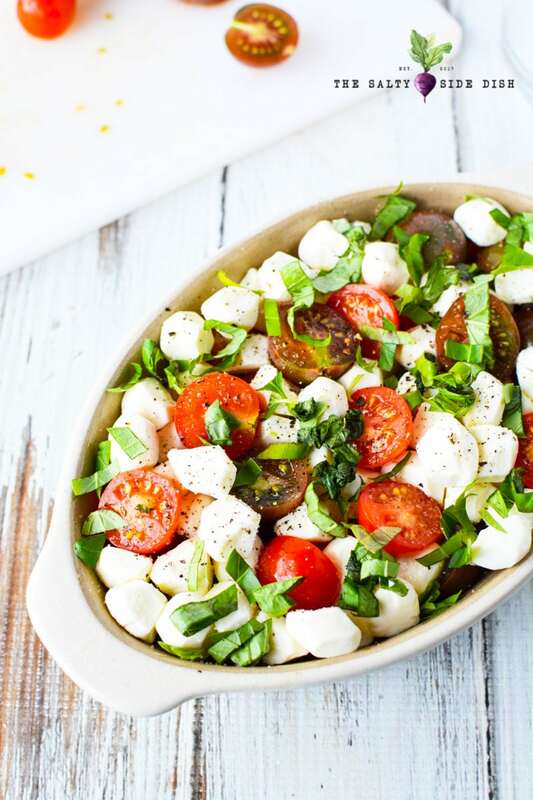 Looking for more Caprese Salad Recipe Ideas? 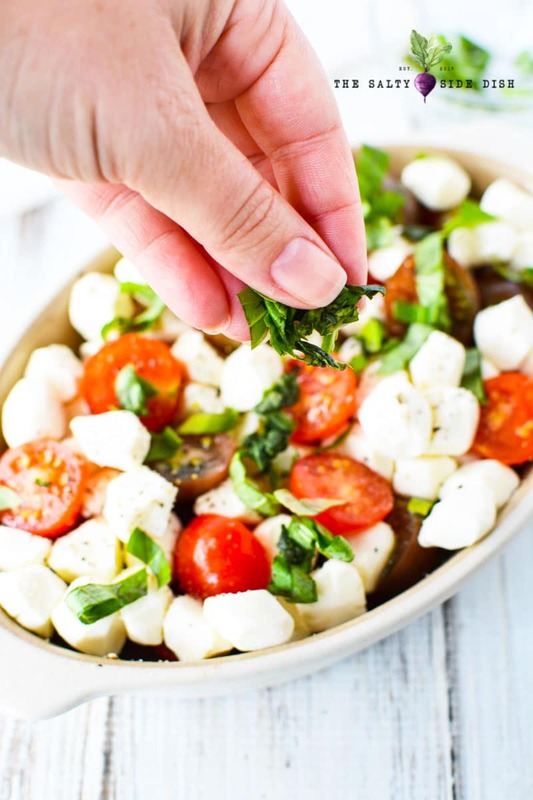 I love making caprese salad from traditional ensalada caprese to a perfect caprese pizza, so here are my favorite options to get your cherry tomatoes and mozzarella on. 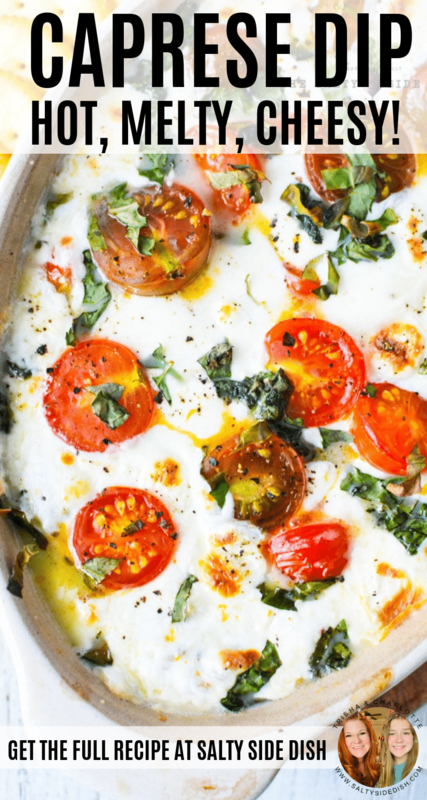 Caprese dip is melty chesy goodness but another amazing dip is Enchilada dip, its so good and hearty that it can be eaten for dinner! In a pinch you could also use shredded mozzarella but I personally wouldn’t. There is something about taking the time to use fresh cheese that really makes a dip! Balsamic Reduction (made from homemade balsamic vinegar) also makes a perfect drizzle at the end right before you eat. 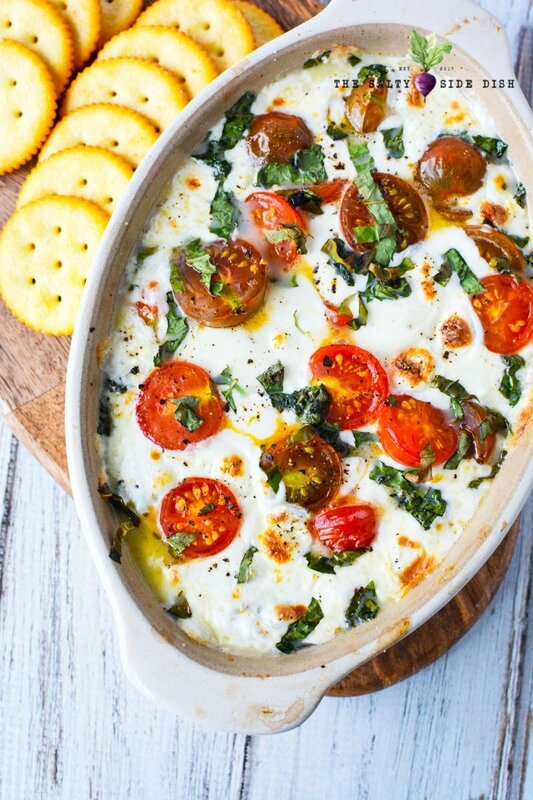 Make this while your dip is heating up in the oven. 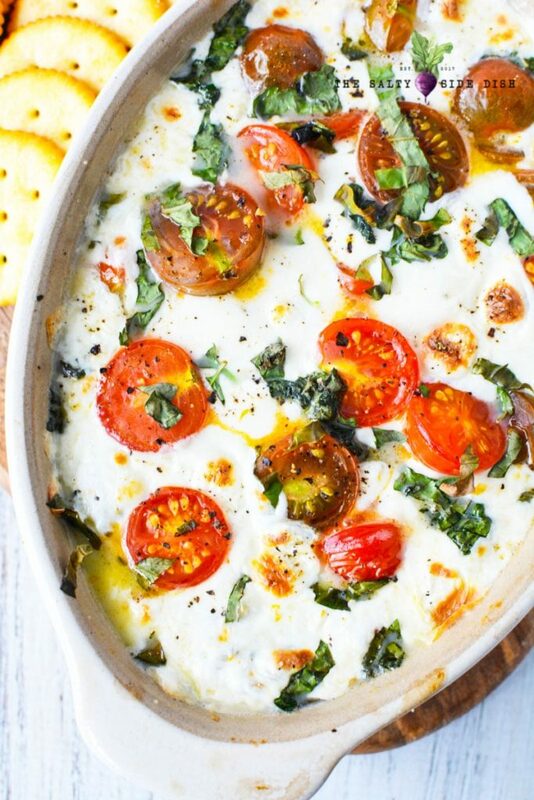 Can you make Caprese Dip ahead of time? Nope! This one is heat and eat or the mozzarella cheese re-hardens. I have not made it in a crock pot, but you could likely quadruple this recipe and heat on low and then the cheese would stay melted. I intend to let you know about this in the future. Can you substitute mozzarella for other cheese? Yep! I always say give it a shot. Cheese is pretty versatile and I cannot think of a reason it wouldn’t ultimately melt and be dippable. 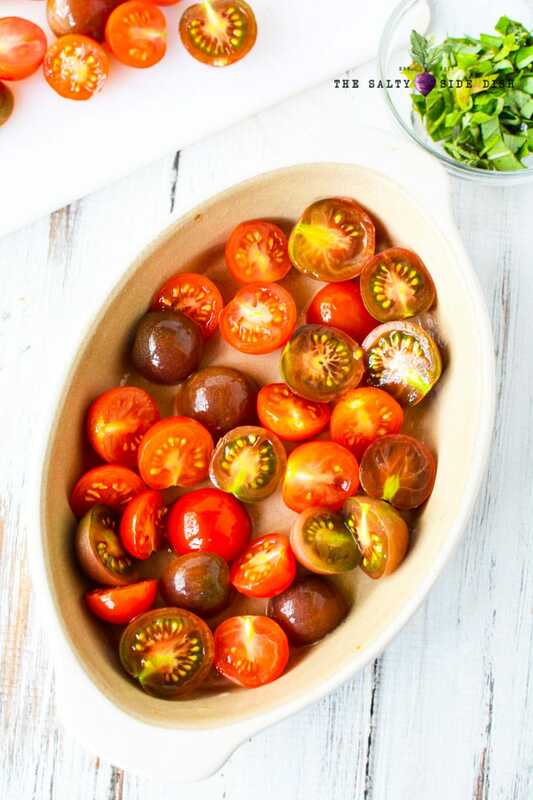 Preheat oven to 375 and add half of the tomatoes to a small baking dish. Add half of the pearl cheese and repeat. Sprinkle basil on top and bake for 15-18 minutes or until cheese is melted. Please note that the juice in your tomatoes will be…well…juicy. That is part of the recipe! Serve immediately with melba toast or tortilla chips. Looking for more Appetizer recipes or finger foods? Add half of the pearl cheese and repeat. Season with salt and pepper. Broil for 2 minutes. Serve Immediately.